Ages 5 through 10. The activities in Picture Based Phonological Awareness Resource are perfect for children with language learning disabilities who have difficulty responding to auditory cues alone. All activities in this book use creatively-illustrated line illustrations as stimuli for children's responses. Skills emphasized include rhyming words, identifying words that start with the same sound, modifying sounds within words to create new words, identifying consonant and vowel changes in words, and MORE. Children with language disorders, memory problems, and attention deficits will benefit from the materials in this practical, easy-to-use book. Reproducible Picture Card Activities. The reproducible picture cards in this section can be used to help children learn about the sound structure of words as they identify rhyming words, delete sounds to create new words, and change words by modifying specific sounds. As children participate in the activities, they learn that sounds can be combined in various ways to create words. Picture-Based Activities for Specific Skills. Each activity in this section includes a picture page and a reproducible worksheet. Activities are included that challenge students to think of words that have specific sounds, to divide words into syllables, to modify specific sounds within words, to create new words, etc. 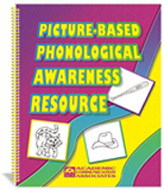 The activities in this book strengthen phonological awareness so that students can participate effectively in classroom reading and writing instruction. Reproducible worksheets are included. A downloadable version of this product is also available. Select the RELATED PRODUCT link below to view.